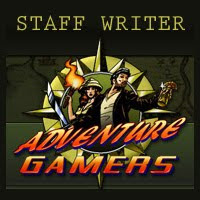 This review is a part of the 'Casual Collection: October 2011 New Releases' article. Driving on a lonely road one night, a young woman is attacked by four vengeful spirits, who use dangerous tricks like blinding and freezing to crash her car, killing her on the spot. Before reaching its final resting place, Jane's soul arrives in an astral library, where she must investigate her past lives to solve grievances and improve her karma enough to earn another chance at her current life. 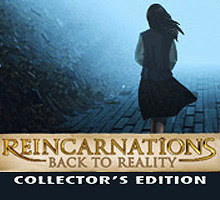 Those familiar with Vogat Interactive's Reincarnations series will recognise the concept as well as the mystically-gifted protagonist, and there's little new in this third installment, Back to Reality. 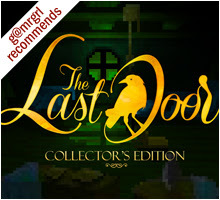 But the good news is that this edition is lengthier, with four cases to solve over five-plus hours this time, and the quests are a tightly-knit collection of moderately challenging inventory, hidden object and standalone puzzles set against attractive, well-designed scenarios. Jane's first incarnation is a village doctor in the early 1900s, who must solve a heinous murder to save the locals who have been blinded by a ghost. The second case is more contemporary, as a museum guard has to recapture a chaotic ancient spirit unwittingly set free by a student. The third story is set at the North Pole, where a child rescued from a shipwreck must free her adoptive family from the clutches of the accidentally released and terribly annoyed Spirit of the North. The final case is the most elaborate and unique, and has a boy trying to save his sister from scientists researching human life longevity via gruesome experiments on a weirdly-forested island in the Pacific. The first and last cases are morbidly fascinating, though the gameplay and styling of the mysterious island is easily the winner. Letters, notes and photos reveal more about each case as events progress, and clicking any hotspot provides straightforward instruction about what to do with it. Quests include collecting practical tools as well as pieces of esoteric puzzles, and then using them to resolve the big problems. The 21 hidden object scenes are stocked with somewhat-relevant objects, and often require multiple numbers of items to be collected, which ups the count well beyond the listed dozen. There are some interactive items too, like wheat to be ground into flour, or a wooden idol to be carved on the spot. Each scene yields one useful object and is repeated once, though items found the first time are left out of round two. Many objects are shared between different search screens, and several are hard to find as they are partly hidden under other things. The independent puzzles cover variations of jigsaws, pattern- and image-matching, easy math, light beam redirection, and the often-maddening Lights Out tasks. Some are creative, like fitting animal cutouts on pegs on a wall, and some are fairly challenging, such as a deceptively difficult jigsaw of a seahorse. 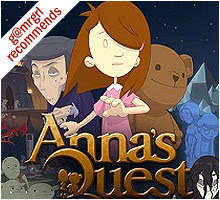 There are three modes of difficulty, and without the benefit of sparkles in the tougher two, you have to pixel hunt for hotspots and revisit scenes frequently to check for hidden object areas that may have been reactivated. Playing time is padded with superfluous activities like moving aside leaves one at a time or clicking repeatedly to clear piles of stone or ice, but thankfully multi-purpose tools like hammers and axes stay in the inventory for as long as needed, thus eliminating repetitive quests to gather generic tools. There is a comprehensive task list, though given the linear format of the game, it's more a helpful guide than a crucial reference. The hundred-odd realistic screens are detailed with shadows, foliage and textures, and distinctly represent each setting, whether the idyllic but creepy village, the museum and its cleverly-engineered tableaux, the Arctic and its Aurora Borealis backdrop, or the outlandish island with its mutant flora and mechanical fauna. A cave-art hidden object screen adds freshness to the typical stashes, and collected items are showcased in appropriate containers like a wicker basket when in the village. The minigames are especially well-designed, with expertly animated doors, rotating parts and special effects. In fact, in-game animation goes beyond the staples of drifting snow and flickering fires to include consistently believable motion, such as a robotic spider standing up or a shark lunging forward. Jane's spirit possessing and leaving her incarnations is also impressive. Unfortunately, some screens suffer from considerable pixellation beyond their native 1024x768 resolution, especially the partially-animated cutscenes, though they do scale to widescreen if you UNcheck the widescreen menu option. 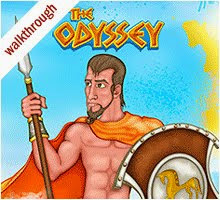 Each scenario has a soundtrack suited to its mood, while sound effects are just right and do not overwhelm the proceedings; together they compensate adequately for the absence of voice acting. Sensible and considerate, Jane is willing and resourceful enough to undo the failings of her past lives. She's blessed with a script that is concise yet precise, albeit sometimes to the point of stating the obvious, and is a companionable partner to play with. Interestingly, though three of her four incarnations are male, her practical personality makes the transitions feel natural and gender-independent. Back to life after her ordeals in the astral library, the Collector's Edition bonus chapter sees Jane soon dragged into the depths of a new mystery by yet another disconsolate spirit. Based on the urban legend of the White Lady, this story is about a rich pirate's daughter who was betrayed by her greedy fiancé and has since been exacting her revenge on random young men by drowning them in the aptly-named Disappearance Bay. The hour-long expansion is similar in gameplay to the main segment, with several inventory quests that send Jane back and forth between a series of underwater caves containing dead bodies, treasure, a shark, and four standalone puzzles including a devilish rotator with pearls to be set in three different patterns. The four hidden object screens are repeated once each. A strictly-standalone affair, the extra case is recommended mainly if the original four leave you gasping immediately for more. Reincarnations: Back To Reality is quite like an episodic television series with a 'case of the week' formula, and loyally follows its two predecessors in concept and gameplay. It's basically a collection of four mini-stories tied together by a flimsy central arc. This is great for variety given the four diverse scenarios, but on the flip side, the stories and characters lack depth as each case is too brief to delve beyond the superficial. 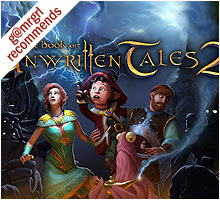 But Reincarnations makes up for its simplistic plots with solid execution, and is packed to the brim with engaging casual adventuring. Despite the niggles of the harder modes – tough-to-locate hotspots, hidden object areas reactivated without notice, some clueless wandering – the game provides over five hours of activity-oriented entertainment, and if you're still craving more, serves up a fifth case as the CE extra. And if even that's not enough, rest assured that yet another reincarnation is on the horizon.